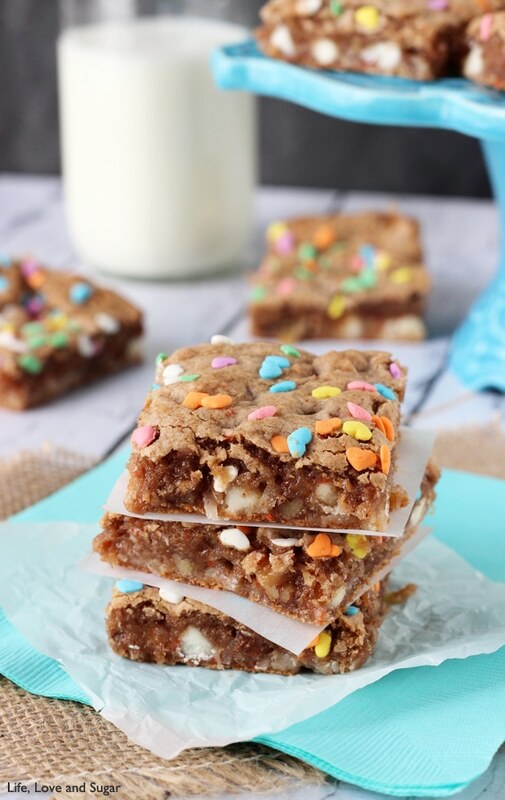 These Carrot Cake Gooey Bars are sweet, full of pineapple, coconut and white chocolate, and super moist! 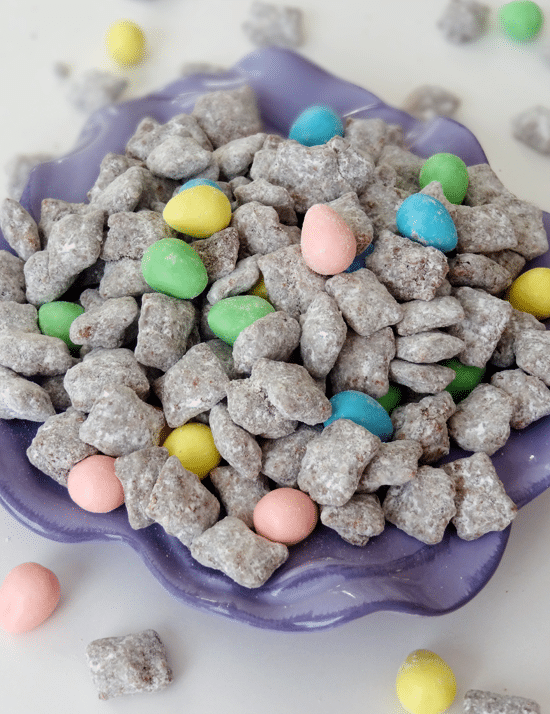 Can you believe Easter is less than a week away?! It has totally snuck up on me! I am not at all prepared. I will probably be running around like a crazy person on Thursday or Friday night trying to get everything together. Normally my mom pretty much takes care of meals when we are all together for holidays – even when it’s at our house. She prefers doing it and since I work full-time, she likes to take the load off of me. I do not complain. I tend to be a bit of a control freak and little OCD about certain things, but we pretty much do things the same way anyway. I am her daughter after all. I totally grew up cooking with her. So much of what I do is simply because she did it that way. This year we have my mother and sister-in-law coming for Easter. It’s going to be great and I can’t wait to see them, but now I’m in charge. Eek! Is cake for dinner ok? Yes? No? How about gooey bars? It would be for me, but I’m guessing most would find that unacceptable. Plus, I’m kind of on a whole eating better kick. Totally lame, but necessary. I don’t even want to see myself in a bathing suite right now. I will totally make an exception for a holiday though. I mean, each one only comes once a year. Gotta celebrate and eat all the goodies, right? I know one thing that will be on the list – one of my faves – Cheesy Hash Brown Casserole. Think hash browns are only for breakfast? Think again. These are amazing and I totally put crushed Frosted Flakes on top instead of Cornflakes. Added sugar = sweet and salty perfection. 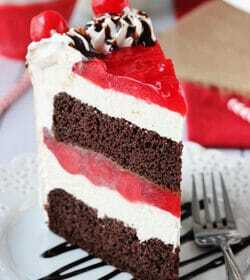 I’ll be making this ahead of time. 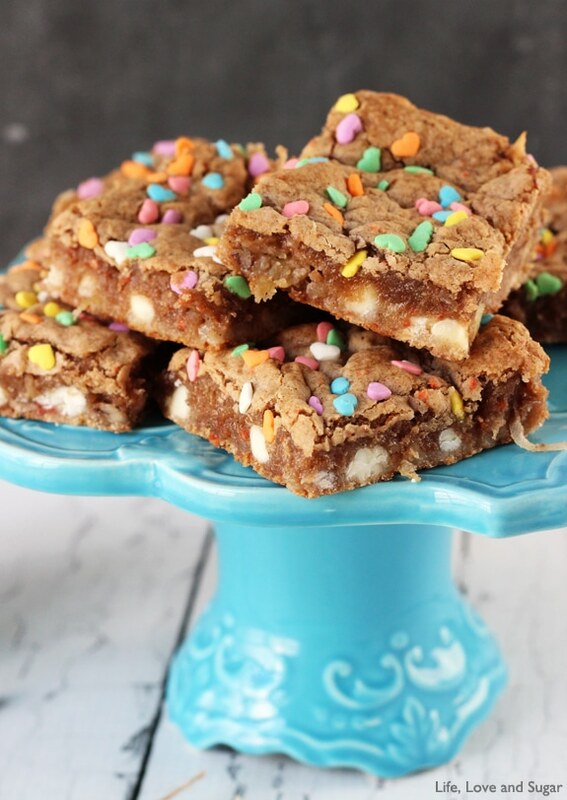 And speaking of sugar – these Carrot Cake Gooey Bars are deliciously sweet and oh so yummy! 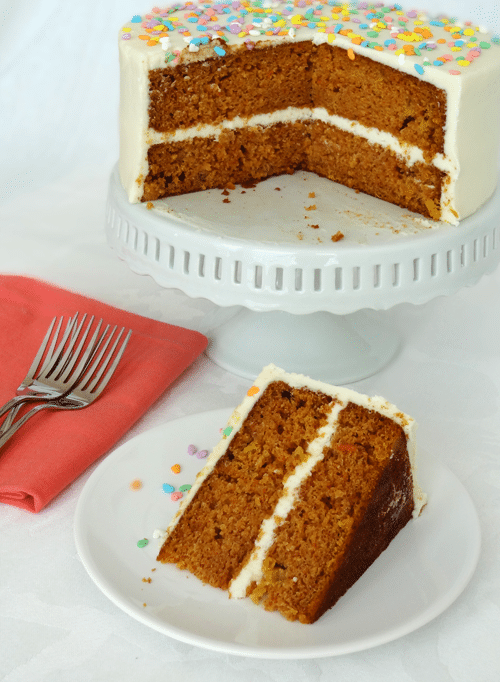 They start with a carrot cake box mix, and then you ramp up the flavor with some extra cinnamon and sugar, plus the stuff that really makes carrot cake great – pineapple, pecans and coconut. These bars are just full of flavor and so moist. The chunks of pineapple, coconut and pecans are totally necessary – such great added texture! 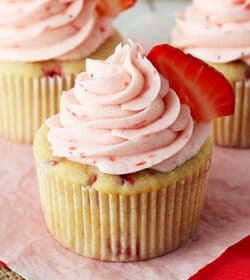 You certainly don’t have to add the pretty pastel sprinkles on top, but they are a nice touch, don’t you think? 1. Combine cake mix, butter, egg, sugar, milk and cinnamon in a bowl and mix until smooth. Batter will be thick. 2. Stir in pineapple, pecans, and coconut flakes. 3. Line the bottom and sides of a 9×9 pan with parchment paper. 4. Add a little more than half of the batter to the bottom of the pan and spread evenly. Because the batter is thick, it might help to drop spoonfuls into the pan, then spread. 5. Add the white chocolate chips in an even layer on top of the batter. 6. 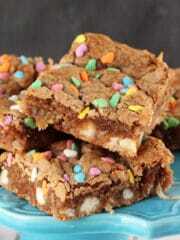 Pour the sweetened condensed milk in an even layer on top of the white chocolate chips. 7. Drop spoonfuls of the remaining dough on top the sweetened condensed milk, spreading it a bit to mostly cover the other layers. 8. Bake at 350 degrees for about 30 minutes. It will still be a little jiggly. 8. Allow to completely cool in the pan, then remove from pan and cut into squares. Bars should be good stored in an airtight container for 7-10 days. Ooooooh I love these!!! SO perfect. I would do an half hour of walking lungs to offset the fact that I need one of these. Despite the fact they will go straight to my thighs! I have no idea why I look at this website when I’m dieting. It’s torturous. Everything you make is amazing ! You should have a Youtube channel..
Lindsay, I feel that Easter is creeping up so fast, too. One minute I thought I had plenty of time and now I’m kind of scrambling. I’m a little CDO… OCD in alphabetical order… lol. 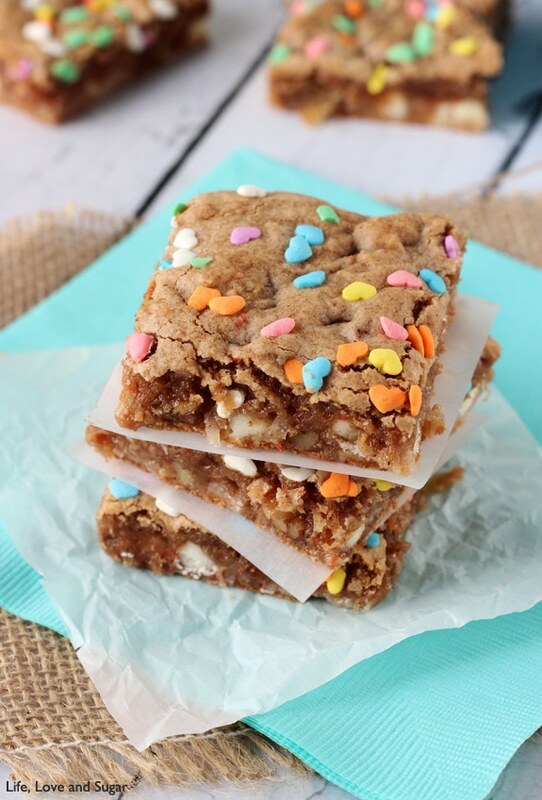 Loving these gooey bars! And, the sprinkle action up on top! 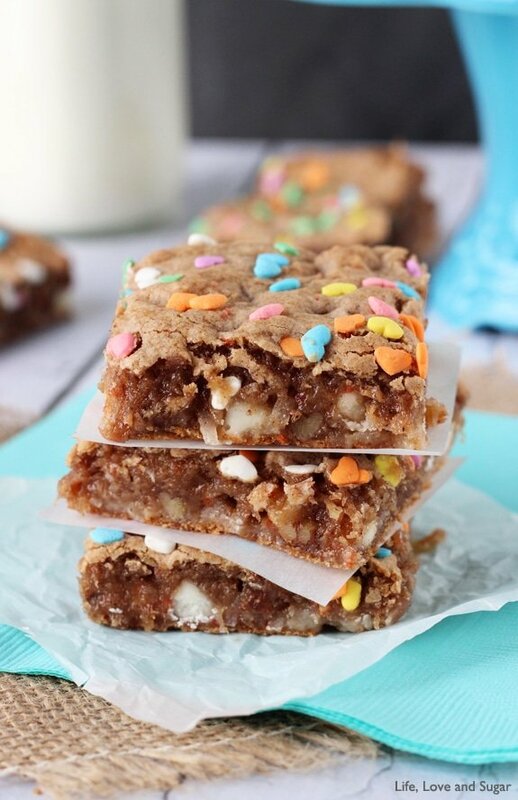 Gooey bars are a totally acceptable thing to serve for dinner! Just kidding…probably not. Good luck with the Easter preparations! These bars look sensational!! So gooey and moist and dreamy! Yum!! I love anything having to do with carrot cake, so I know I would love these! These are seriously a thing of beauty!! Gooey and carrot sound amazing together! All you have to say is gooey and I’m sold! Totally! I love gooey anything! 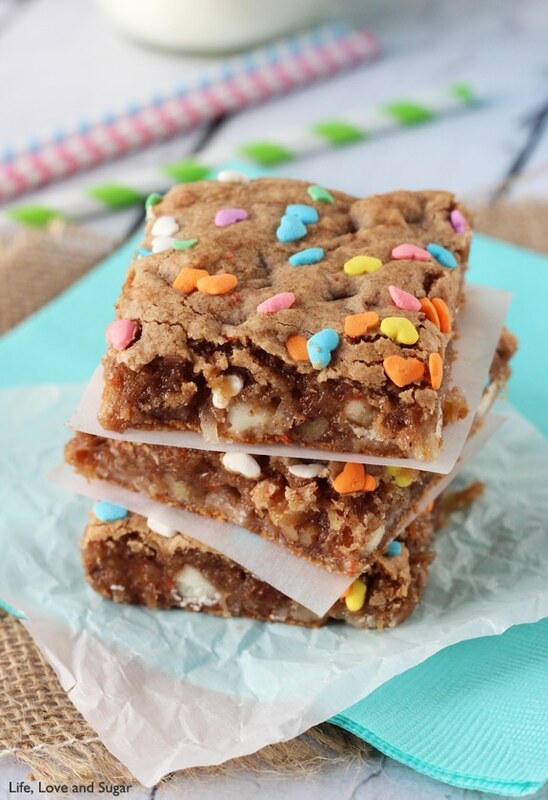 Mmmmm, carrot cake gooey bars sound like a thing I like to call perfection! 😉 They look incredible, Lindsay!! Pinned! I drool over your blogs for two hours (no kidding) then make up my mind, run to the store, buy the stuff, and then open your website….then get distracted by other recipes…sigh- will have to run to the store again. I just HAVE to eat this or else I will never forgive myself. Love you, Lindsay. 🙂 Thanks once more.